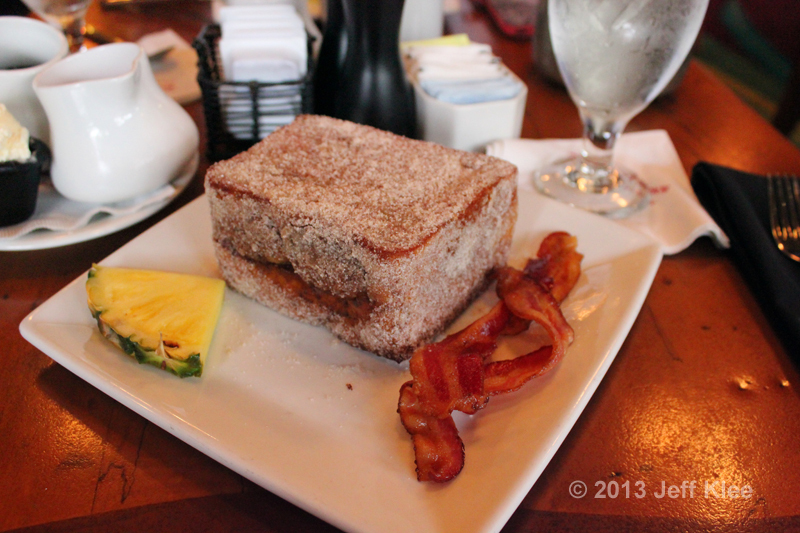 Breakfast this morning was at the Polynesian Resort. 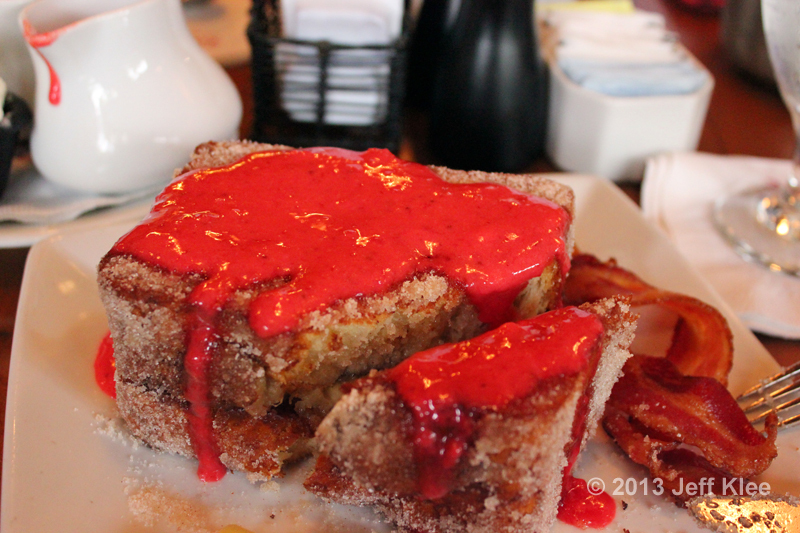 I had been looking forward to ordering another Disney favorite, Tonga Toast. Before the meal came out, the condiments were delivered. 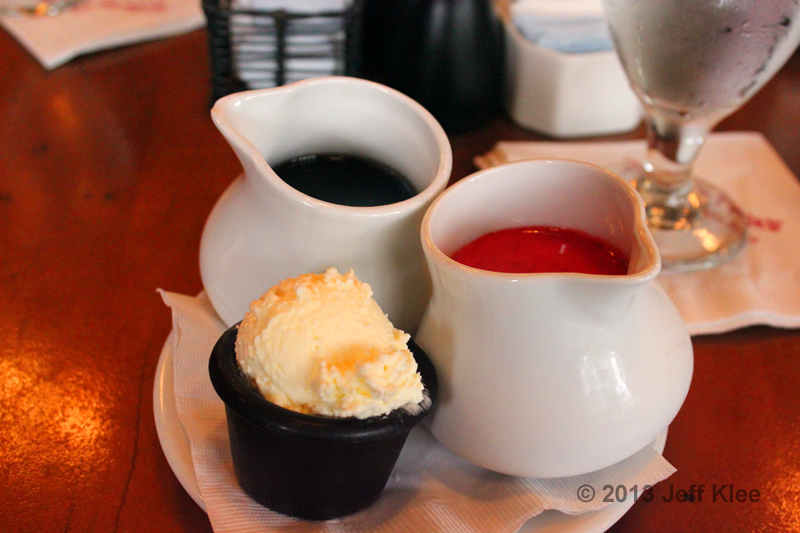 They consisted of butter, maple syrup, and a cold strawberry compote. The toast consists of two very thick slices of sourdough bread, sandwiched around banana, and then rolled in cinnamon sugar. It comes with a side of ham, bacon, or sausage. You can see my choice here. The bacon was not crispy, but in this case it could have been left off altogether and it wouldn’t have affected the meal at all. 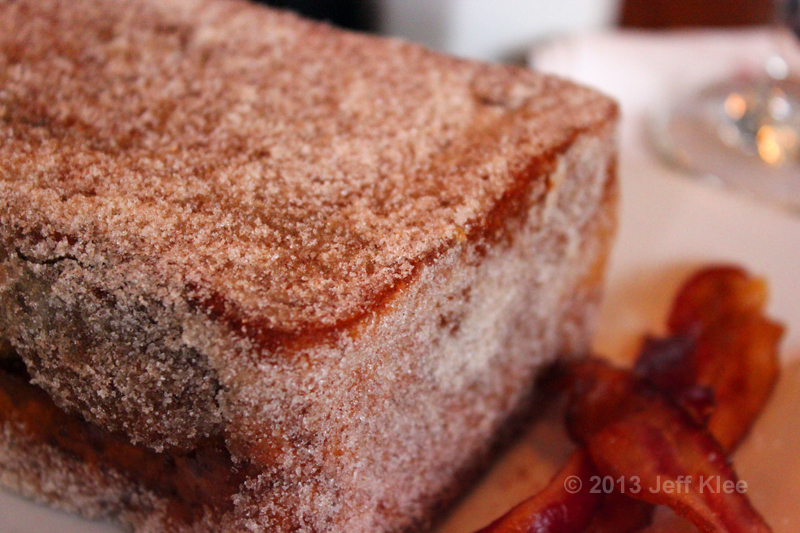 This closeup view of the cinnamon sugar shows how well the bread is coated. This is my meal, ready to eat with added strawberry compote. I left off the butter and maple syrup. Needless to say, this breakfast is very sweet. Sourdough bread, loaded with cinnamon sugar, filled with banana, covered in liquid strawberry (and maple syrup if you choose). There is not one thing on this dish except for the side of bacon that isn’t almost pure sugar. I say this as a good thing of course, being someone who loves sweets. This is one incredible meal. The toast is very crispy on the outside and extremely moist on the inside. 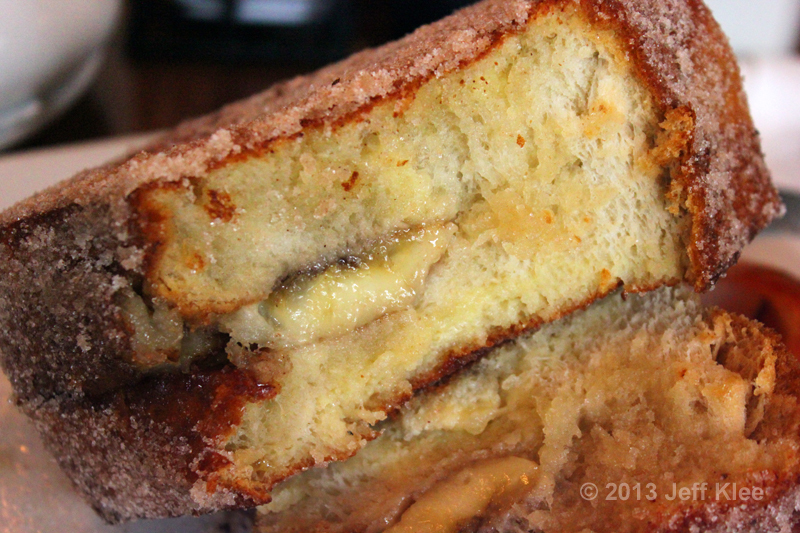 The cinnamon and sugar on the outside just adds to the crispy texture, while the banana inside adds to the moistness. Everything blends well together, the banana and strawberry combine for a familiar fruit combo, while syrup and french toast will always go hand in hand. This, along with yesterday’s Kouzzina french toast breakfast, was the second time I think I’ve eaten french toast without adding maple syrup. There is more than enough added sweetness that you’ll never have the taste that you’re eating just a dry piece of toast. Rating: 10/10 This is the second time I’ve had this breakfast, and it will probably become a traditional meal I have to get during every visit to Disney. After breakfast we headed to the Animal Kingdom. First stop before any rides was the Kusafiri Coffee Shop and Bakery. I had three items to pick up here, but due to having just finished breakfast and my fear of how big I’d heard these items were, I decided on just one. The white chocolate elephant cupcake is large, however I found it to definitely be more show than taste. It’s a large base to begin with, and then topped with an equally high layer of buttercream frosting. 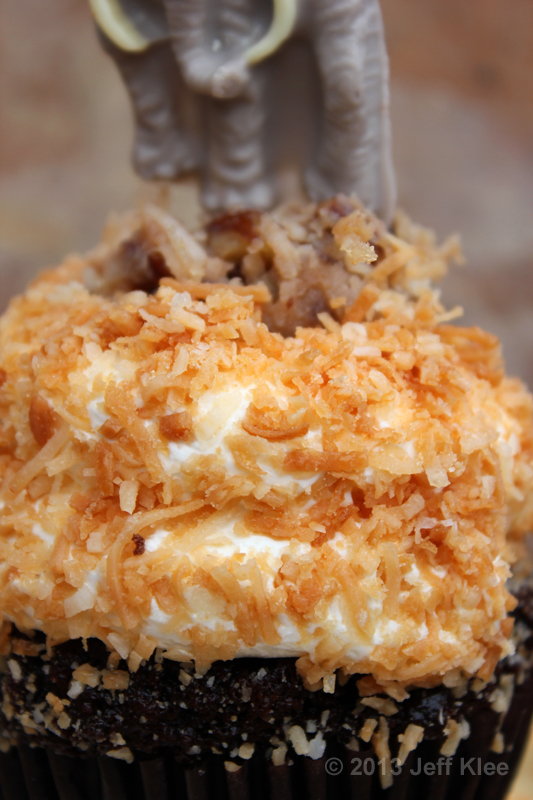 Then it’s topped with a toasted coconut layer very similar to what you’d find in German chocolate cake. Above that is a towering white chocolate elephant. 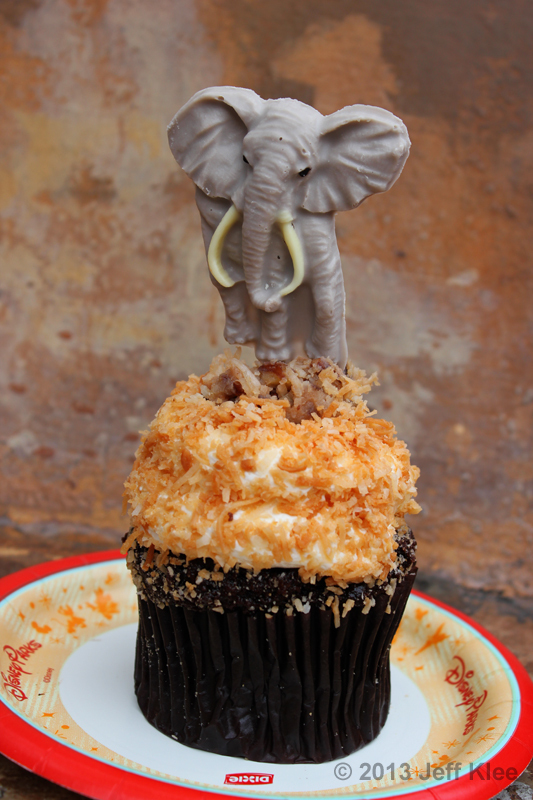 With the white chocolate elephant on top, this cupcake is taller than a dollar bill. 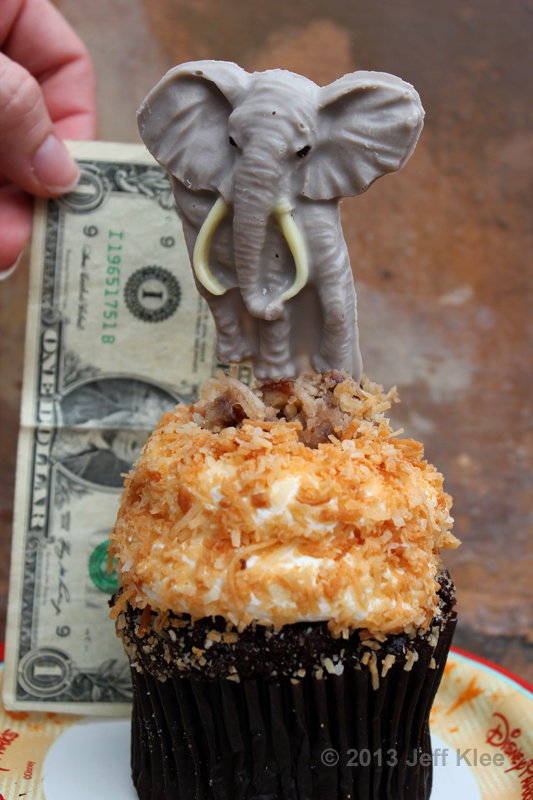 Even without the elephant, it stretches to the height of most Disney cupcakes, which is more than half a dollar bill’s length. I love the detail that this elephant has, including having three different colors involved. It tasted of basic white chocolate. The base layer was not very moist, but not too dry either. There is a discrepancy on the cake layer. Their menu describes it as “rich chocolate cake filled with chocolate cream.” Some folks have claimed to have gotten exactly that, while others have said theirs did not have the chocolate cream filling. Mine did not have any cream filling unless it was mixed and baked directly into the cake here, which I don’t think is the intention of the description, nor what was found by those that HAD found the filling in theirs. I would have definitely liked this much more if it actually had a cream filling inside. The frosting layer was good. 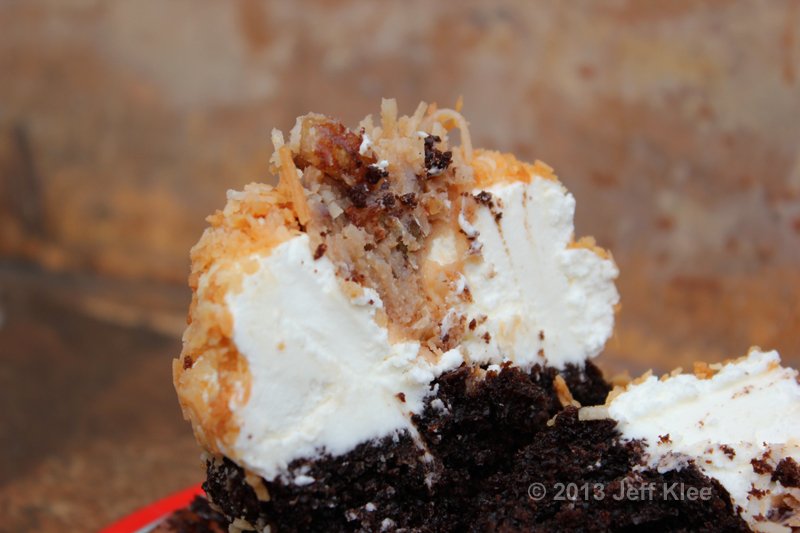 While you can see the “German chocolate” coconut layer does actually dip deeper into the frosting in the middle, it still didn’t have enough content for me to really taste. 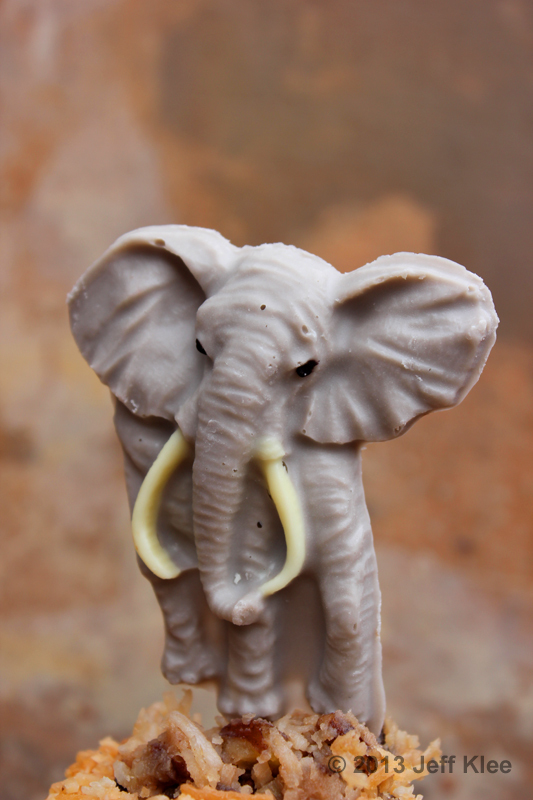 As mentioned, the chocolate elephant was just basic white chocolate and I found it slightly light on flavor, but still good. 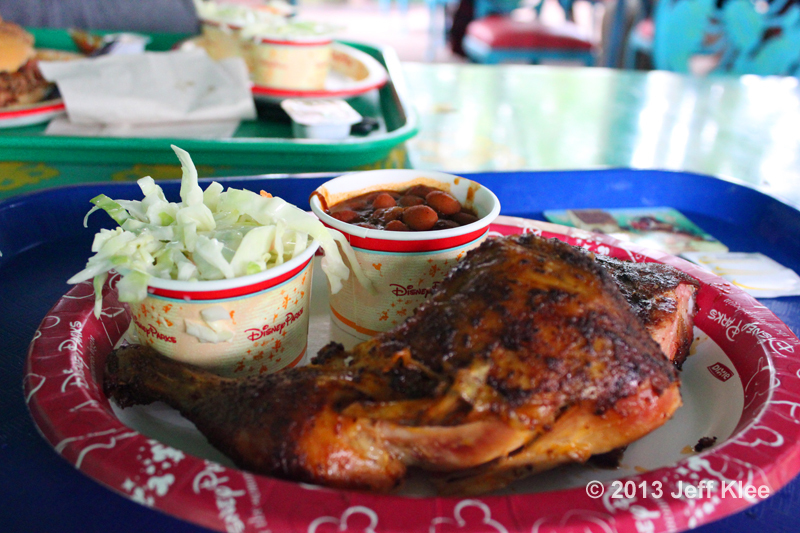 I had heard great reviews of Flame Tree Barbecue and decided as we were walking by to stop and eat. 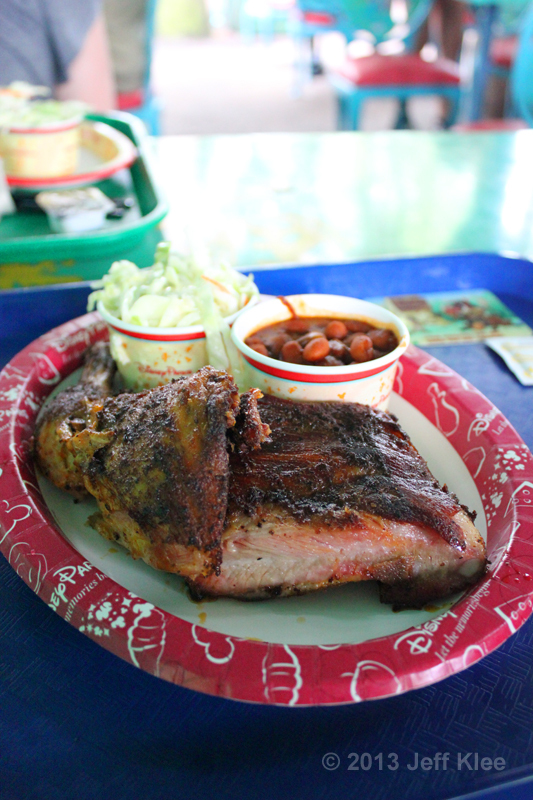 I ordered the combo meal which had both the chicken and ribs, and came with a side of coleslaw and baked beans. The barbecue flavor on both the chicken and ribs was fine. 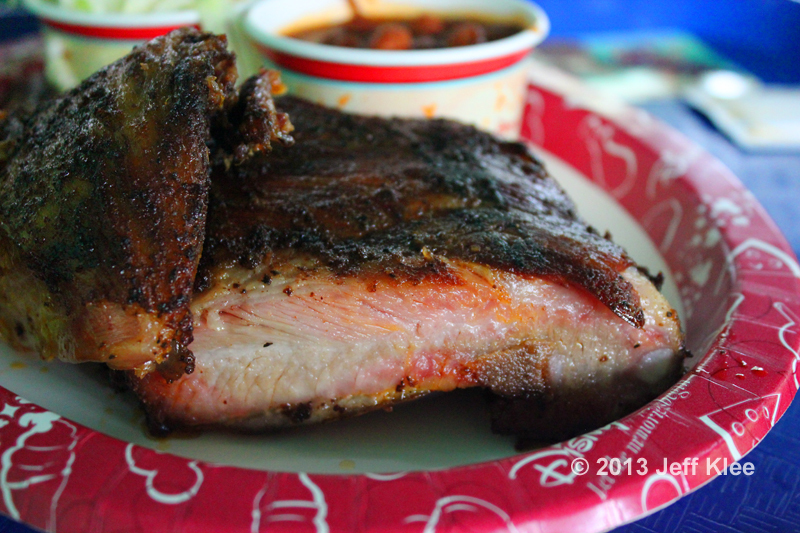 The ribs were poor quality. They were very high in fat and chewy. I don’t know if it was a poor quality choice of rib, poor cooking technique, or a combination of both. The chicken was great. It was moist and came off the bone easily with just the plastic fork. The side of coleslaw was average and lacking a strong flavor. The baked beans had a good barbecue flavor to them that was enough so that I wasn’t bothered by the lack of ketchup around, which I usually put on them. The ribs unfortunately really lowered my overall rating of this meal. On the way back to the Magic Kingdom, we stopped at the Art of Animation Resort for an order of Cheesy Pesto Bread from the Landscapes of Flavor food court. 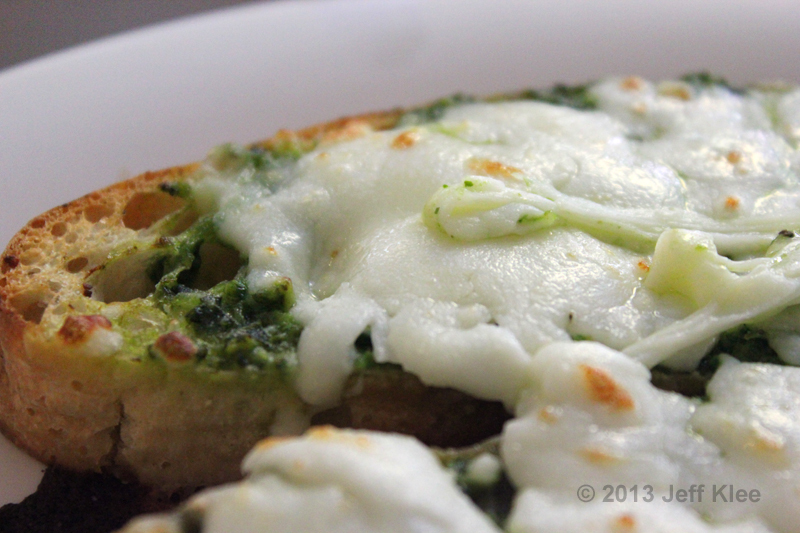 It is sliced ciabatta with pesto and melted mozzarella served with marinara sauce. The cheesy pesto bread was tasty. The bread was soft with the edges being only very slightly crunchy. This is just the way I like it. I dislike overly crusty bread that almost hurts to bite into. 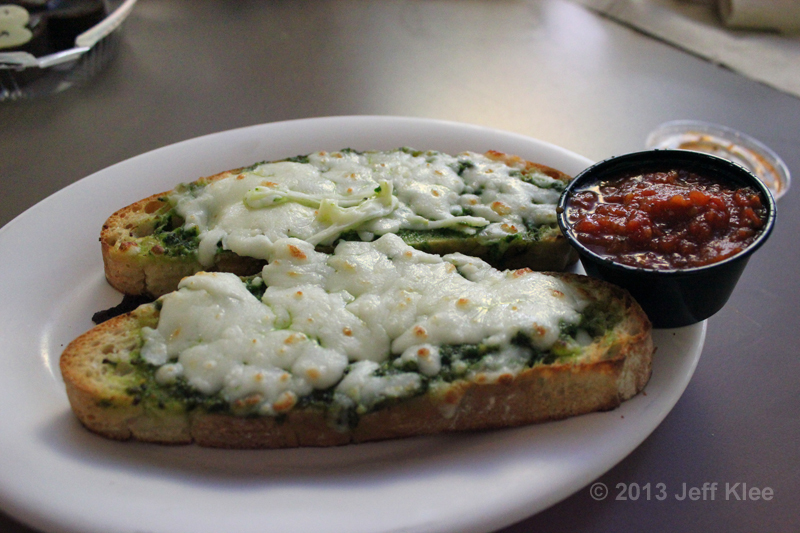 The quantity of cheese and pesto was more than enough to taste both. The marinara sauce for dipping really helped to complete this great tasting snack. 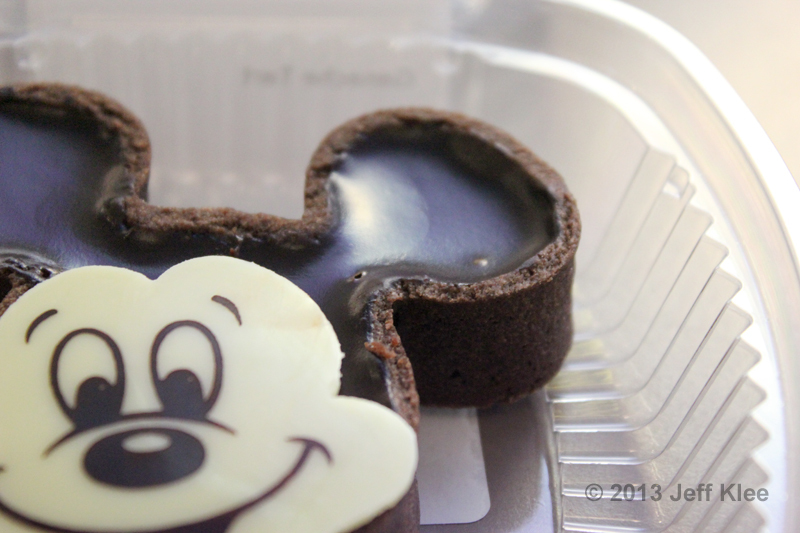 Along with my order of Cheesy Pesto Bread, I got a Chocolate Mickey Ganache, or as some of the eateries call it, the Chocolate Mickey Tart. I thought it was great! 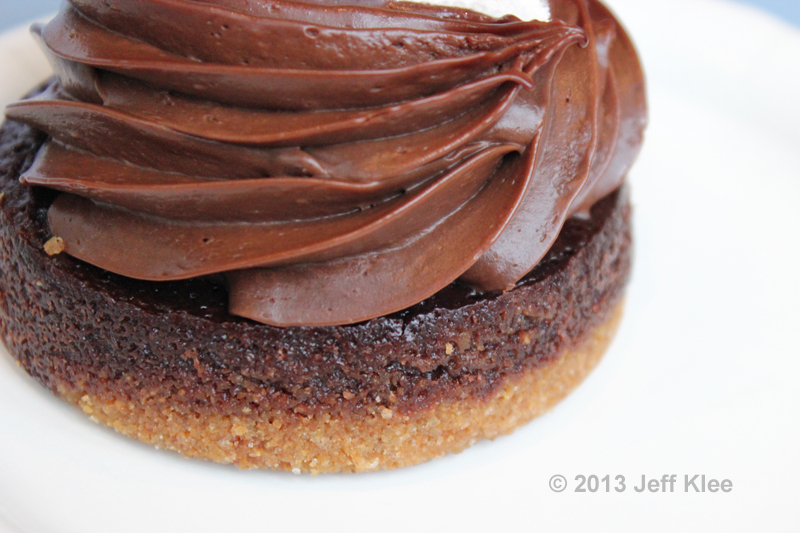 A chocolate cookie crust was filled with thick, creamy, rich chocolate ganache. 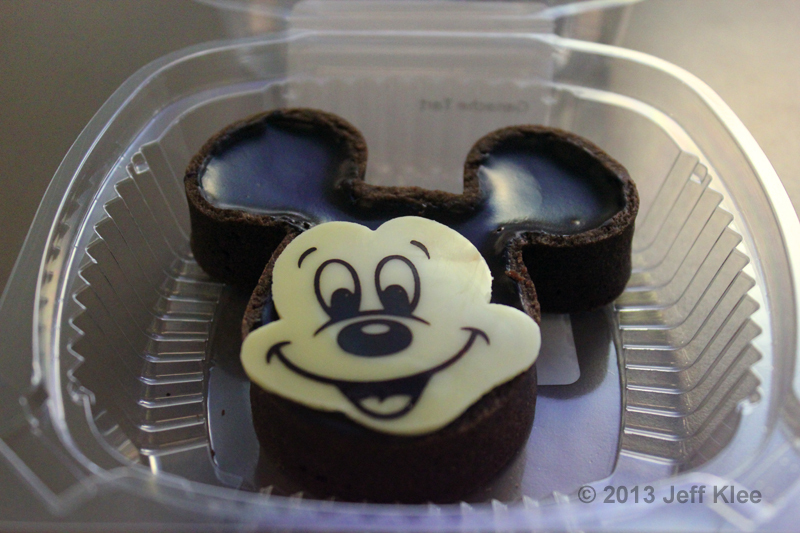 They also place the obligatory white chocolate Mickey face to complete this treat. Great tasting ganache, the crust was almost irrelevant. While walking through Magic Kingdom, we saw a food cart that had Cinnamon Candied Almonds. 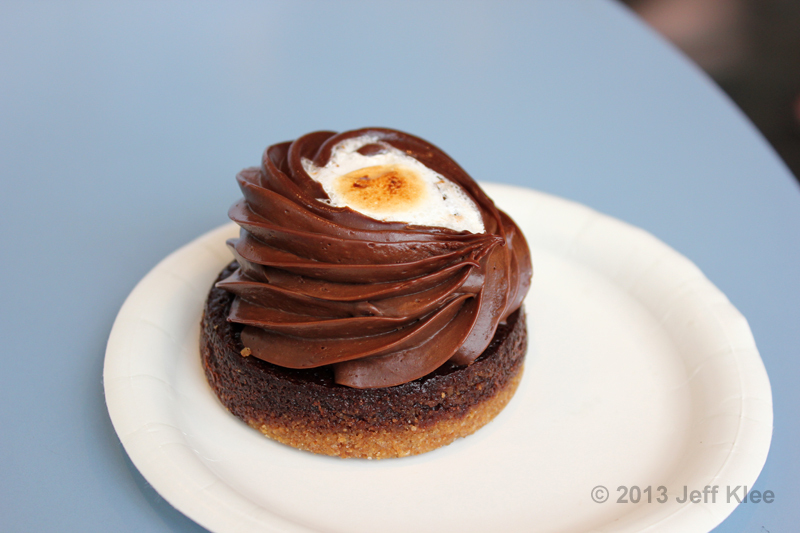 I had remembered reading a positive guest review recently by Joey Beyer on Disney Food Blog. I figured since I saw them right here, I’d give it a try. I’ll admit this one surprised me quite a bit. Note: Since we just grabbed this snack to go while we were walking through the park, I didn't want to take the time to stop, pull out the camera, and photograph this in the drizzling rain, then have to put everything away again and eat my food after it started getting cold. The photo above and below were taken by Joey Beyer, and can be seen in the article linked above. 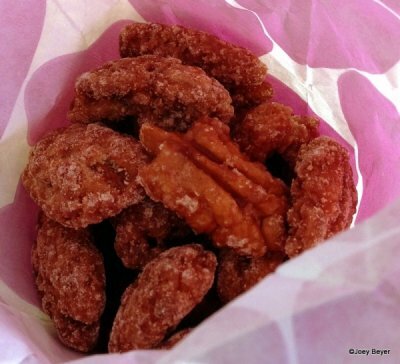 I realize the photo below is actually pecans, which is what Joey had eaten, and therefore photographed. His photo was so detailed and well done with everything from lighting to focus, I decided to use it. My almonds looked exactly the same, just with a different nut. These were really good! Warm, sweet, crunchy, and cinnamony (it’s a word, don’t try to correct me). I thought, “almonds, I eat those at home because they’re healthy. Why would I have them on vacation?” Now I know why. It’s an extra sugary snack that I’ll have to get again. I love being surprised by food, and with as much as I eat, that’s hard to do. 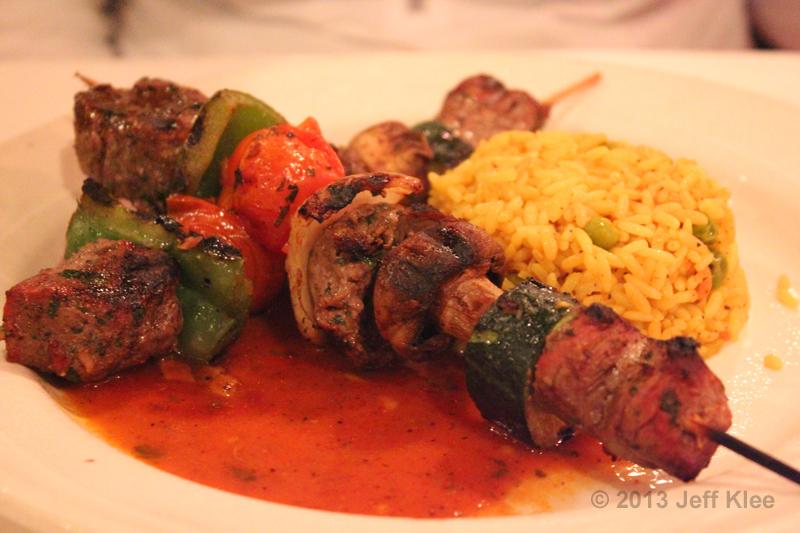 We went back and forth on dinner reservations, and finally settled on Restaurant Marrakesh. I definitely wanted to try a restaurant in the Epcot World Showcase that I hadn’t been to before. I started off with the Appetizer Combination for Two. 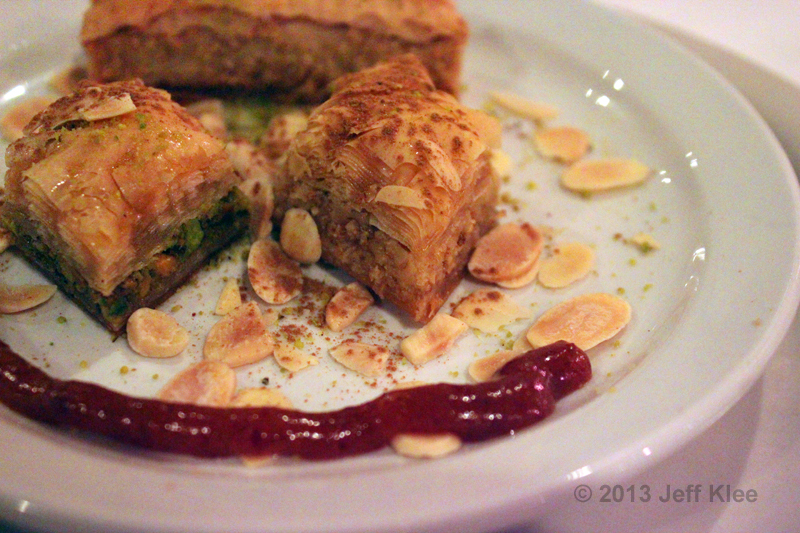 It included Beef Brewat Rolls, Chicken Bastilla, and Jasmine Salad. The salad was fairly average to my taste buds. 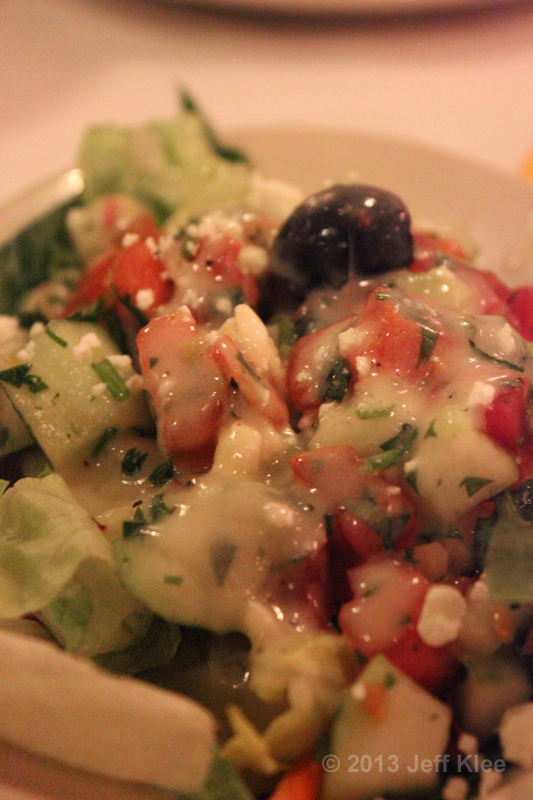 It had lettuce, tomato, olives, and feta cheese in mustard vinaigrette. Unfortunately, none of those ingredients really stood out with flavor. 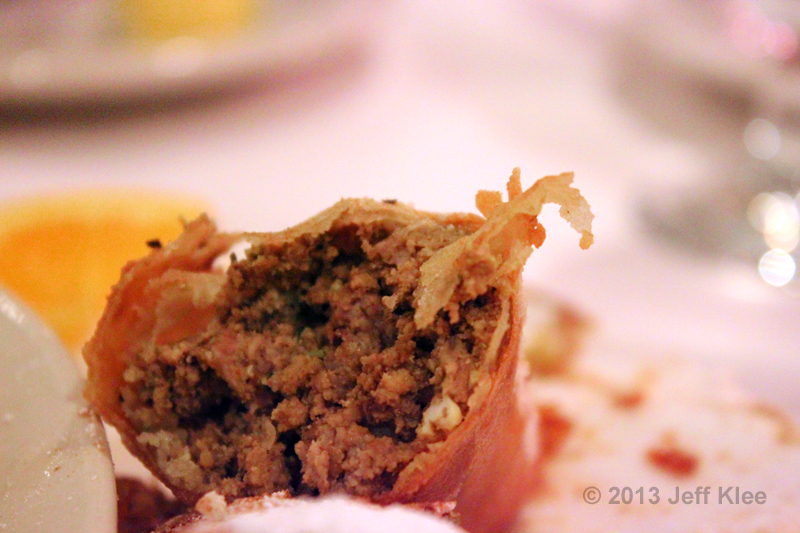 The Beef Brewat Rolls and Chicken Bastilla were unlike anything I’ve ever tried before. It was a sort of a mix between appetizer, entrée, and dessert all in one. I had no idea what to expect from the taste of these. 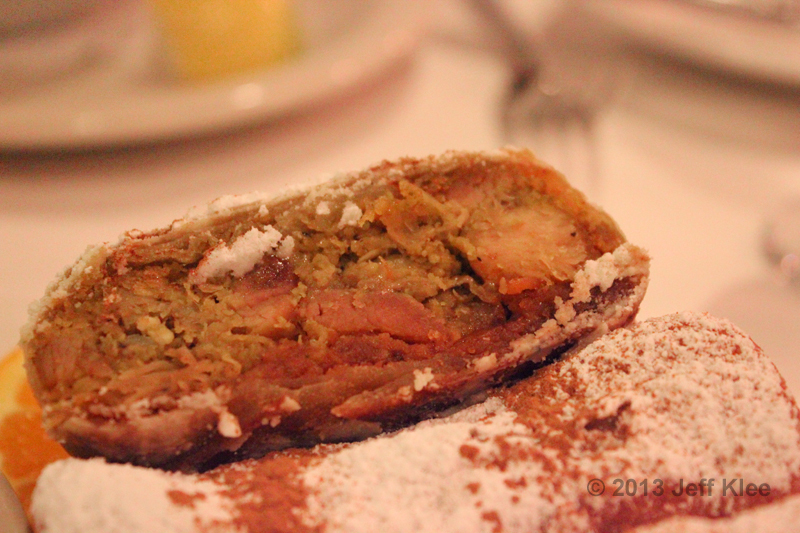 The Chicken Bastilla were phyllo dough filled with minced chicken and almonds, then sprinkled with cinnamon and powdered sugar. These were good, and the cinnamon and sugar was something not often found in an appetizer. There was a solid amount of food filled inside the dough, but I felt it was slightly dry. 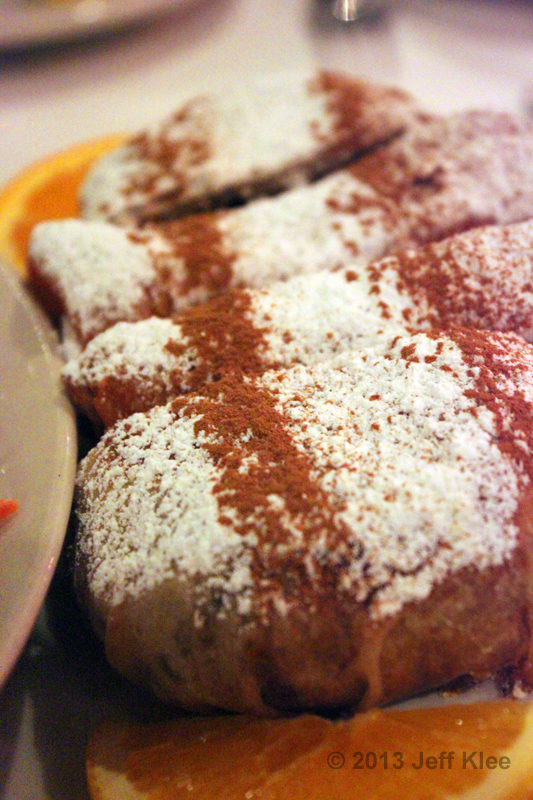 The Beef Brewat Rolls were very similar to the Chicken Bastilla, except these were filled with seasoned minced beef and eggs, then also fried and sprinkled with cinnamon and powdered sugar. I liked the beef much better than the chicken. They were a bit more moist which made them easier to eat. It’s really difficult to explain these two tastes. They were both very unique, and somewhat filling. For those that know Middle-Eastern food, my wife (whose family background is from that region) claims that these tasted very authentic. I think in the future I’d stick with ordering the Beef Brewat Rolls by themselves rather than ordering the combo. My entrée was the Roast Lamb Meshoui. 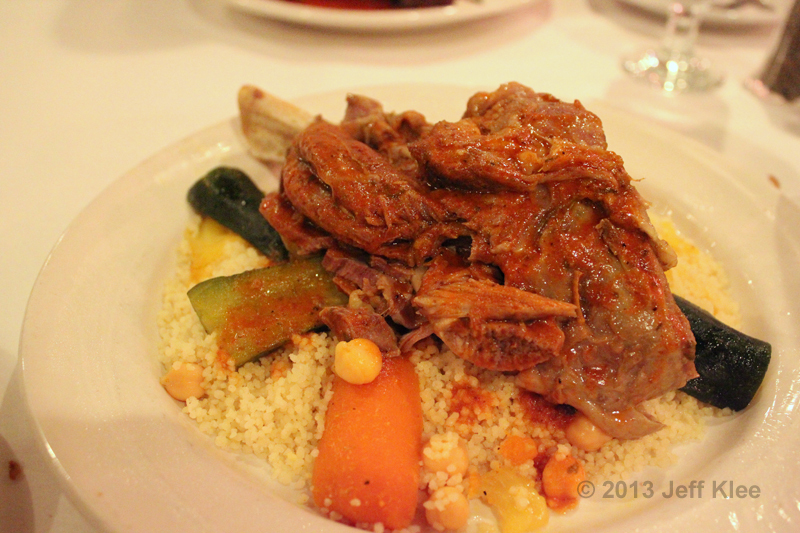 It’s a lamb shank braised in natural juices, served with couscous, carrots, zucchini, and chickpeas. It was extremely well cooked. I picked the bones up by the ends and they slid out from the meat looking like they had been professionally cleaned for display in a museum. The meat was very juicy, and had a wonderful flavor. 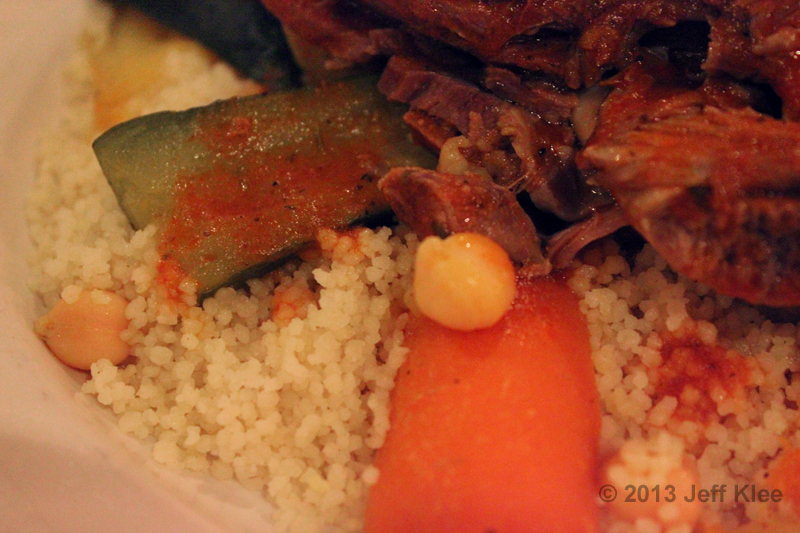 The rest of the dish blended the couscous with the vegetables. The flavor was good, especially considering that personally I find couscous to be a little lacking in the flavor department. The other ingredients definitely kept the taste interesting. My wife ordered the Shish Kebab. It had grilled tenderloin of beef with rosemary roasted potatoes and vegetables. I did not try any of this, but she said she enjoyed it very much. I thought it would be nice to show some other options that are available here. 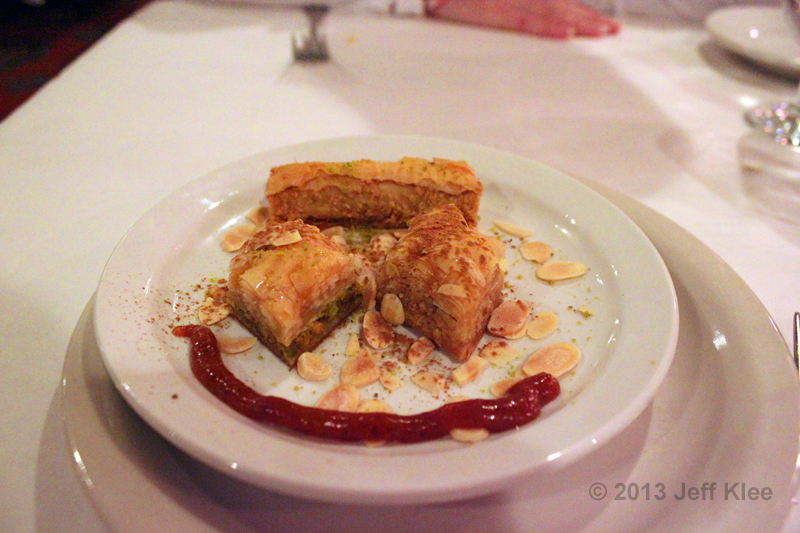 Dessert was Moroccan Symphony, which was a sampling of baklava. 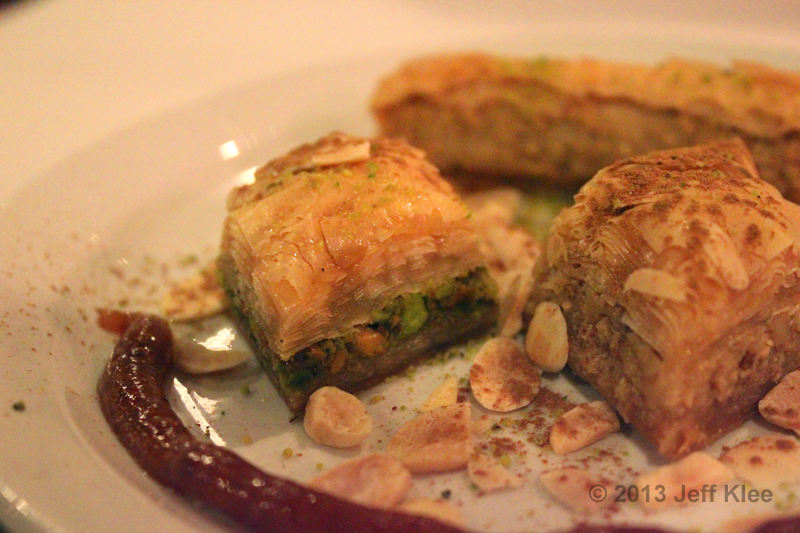 I never thought baklava was too exciting of a dessert, and these were no different. For baklava, in my book these were average at best. 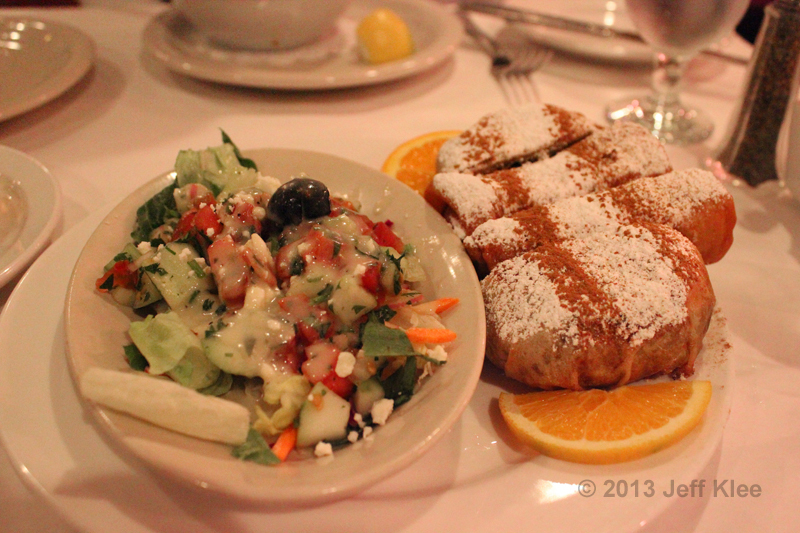 In fact, last time at Disney I had baklava next door at Tangierine Café, and I thought it was really good. I was surprised that they didn’t taste the same here as there’s a good possibility they could be made in the same kitchen. Overall I was not too impressed with my dinner at Restaurant Marrakesh. It wasn’t bad by any means, but I was hoping I would walk away wowed by my dinner. I will probably eat here again, but I still have many other World Showcase restaurants to try on future visits. After dinner we walked over to the America pavilion for a second dessert. 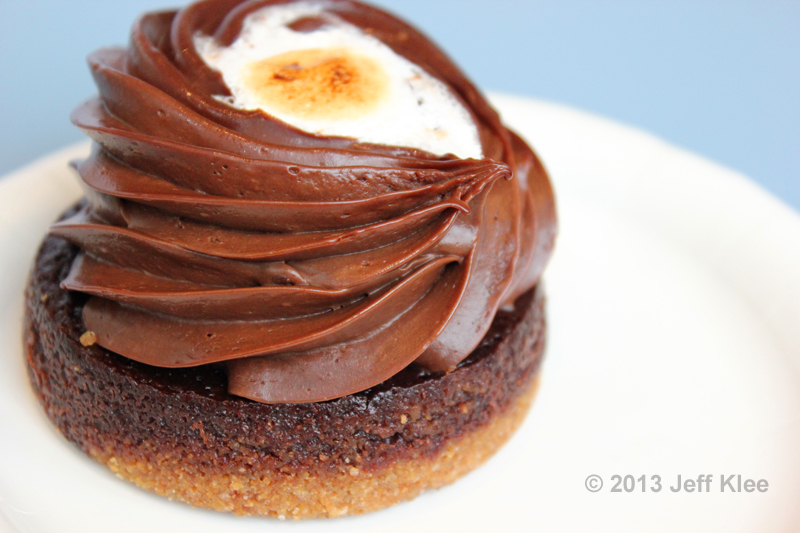 Checking off another item on my list, I bought the S’mores Mousse Brownie. 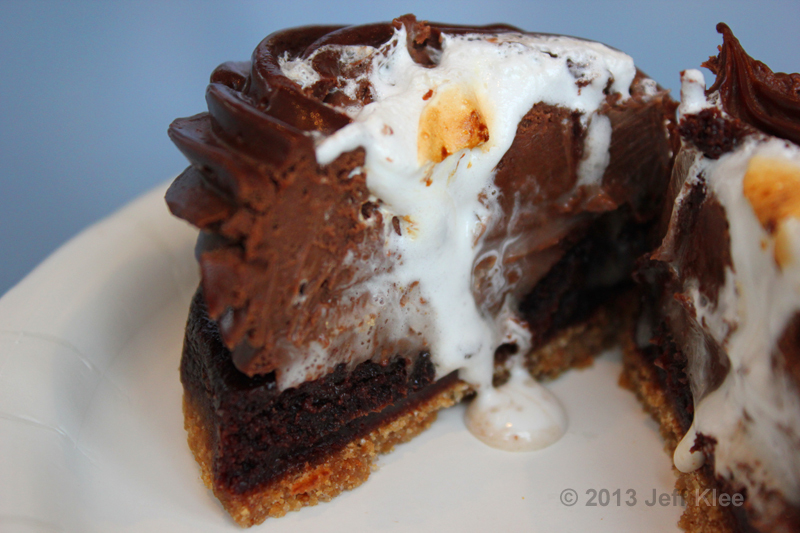 It starts with a base layer of graham cracker crust, topped with a moist chocolate brownie. Then there was the main substance of a very thick chocolate mousse that had the consistency of a softened piece of fudge. It was much closer to fudge than mousse, and that’s a positive in my book. It was super rich, and a chocoholics dream! 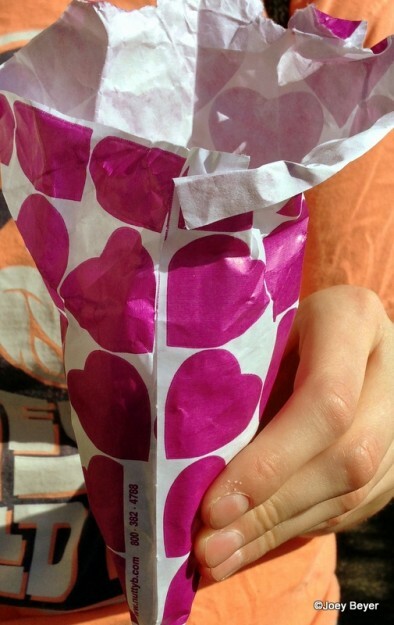 In the middle was a filling of marshmallow. I tried the marshmallow both with the other parts of the snack, and also by itself. It didn’t appear to have much of a taste that was noticeable. 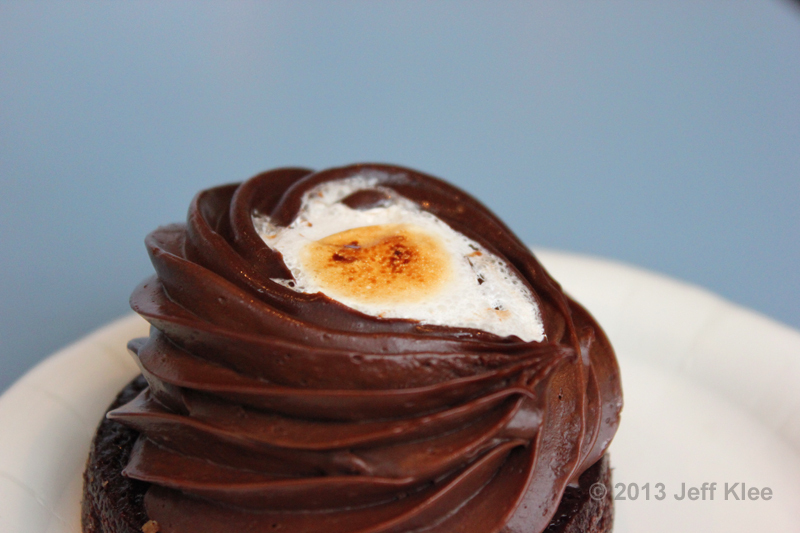 I could have done without it, but it IS a proper ingredient in s’mores, so I guess it needs to stay. They either need to make it have a stronger taste of marshmallow or add more into the snack. You can see how deep the marshmallow goes into the center. It was a little surprising that it didn’t have a stronger taste. Either way, this chocolatey delight as a whole was very good. On the way out of the park I had to stop one last time at Karamell-Küche for dessert number three. Funny thing, we walked to Germany so we could get a real typical American treat. A Rice Krispy® Treat. This one was Karamell’d, which is a phrase I just now made up (used when Karamell-Küche takes any random food, puts caramel on it, and makes it their own unique treat). 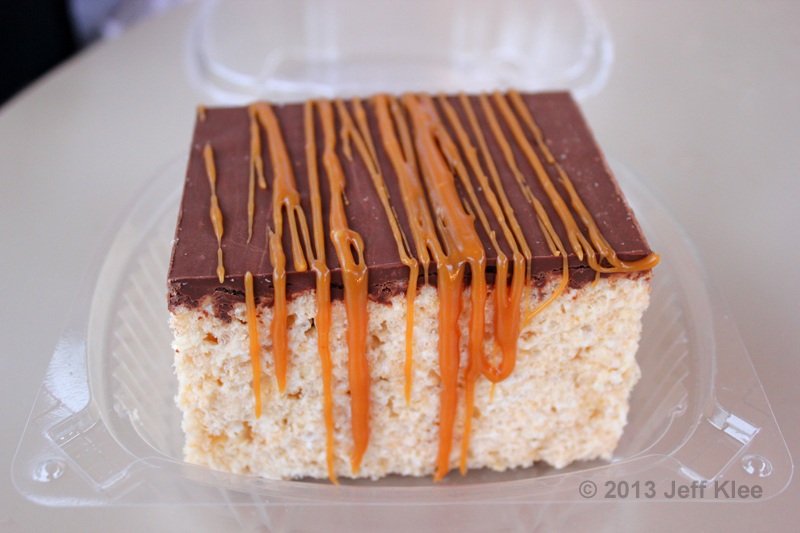 Ok, so this is just a Rice Krispy® Treat with a chocolate layer on top and drizzled in caramel, but it was actually really good for being a basic treat. The funny thing is that its giant size was actually its biggest downfall. 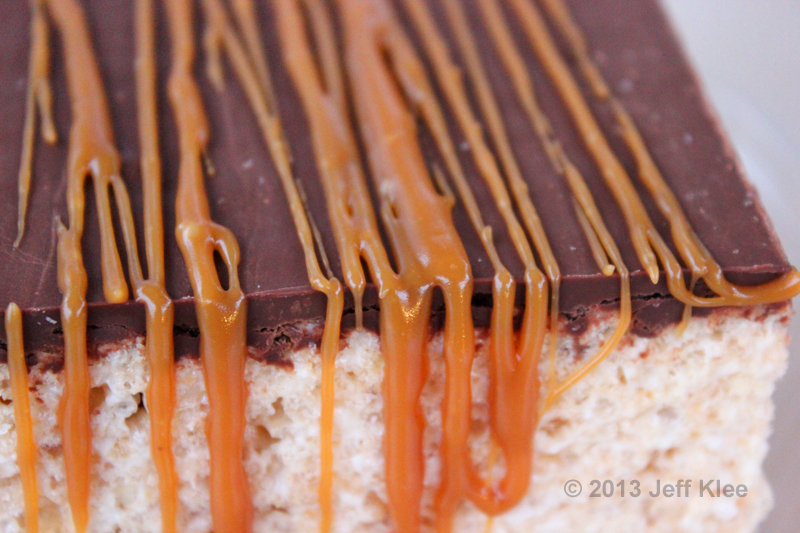 The thin layer of chocolate and minimal caramel meant each bite had 90% Rice Krispy® Treat, and 10% chocolate and caramel. 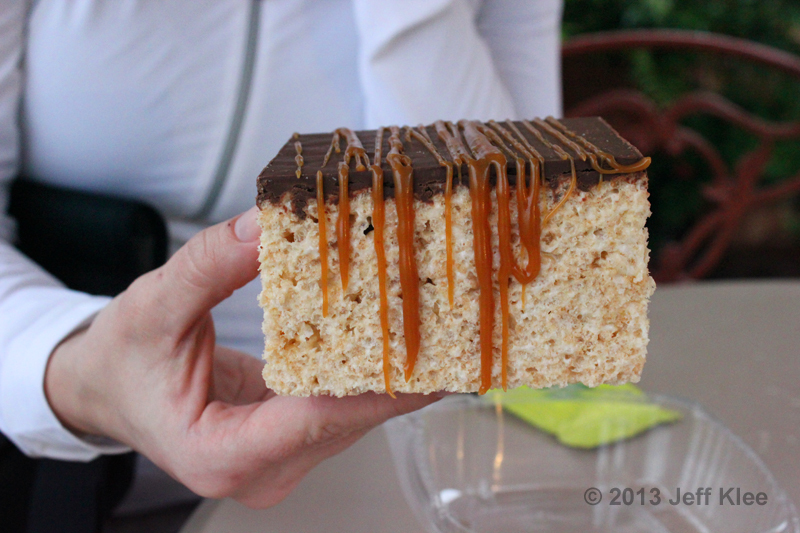 This isn’t a complete disaster as these are wonderful on their own (and this one tasted great to me), but the chocolate and caramel is the only thing that makes this Rice Krispy® Treat stand out from the millions of others you can buy outside the park. If you’re going to change a very common and popular snack, you should really make it stand out as being unique. This one only got half way there, but since even the rice and marshmallow part was still good I can’t really complain. In order to show how big this was, I had my wife hold it in her hand. She ate about a quarter of it, and I of course finished the rest. It was a solid (and filling) end to another great day at Disney.